How can your company be effectively part of the Global Services Revolution that India is leading as it becomes the international services centre? 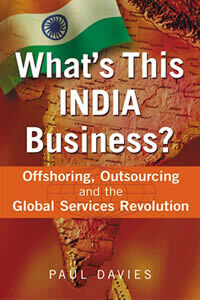 What's This India Business? will introduce you to India and Indian business, illustrate the differences between Western and Indian commercial culture, and give you the confidence to go to India, engage with life and business there, and develop your business by taking business processes offshore. Whether you want to outsource your processes or develop your own services centre, Paul Davies will show you where real value lies, what the pitfalls and the hidden costs are, how you need to approach the negotiations, and then successfully gain competitive advantage with lower costs, greater flexibility, higher quality, and a more responsive organisation. He will show you how to work with Indian processes, the bureaucracy, and the dynamic forces that are turning India into the fourth largest economy in the world over the next twenty years. At the same time, we will be seeing a revolution in jobs, employment and corporate social responsibility in the West - and Paul Davies can start you in the right direction of understanding the issues and what the strategic answers are. You have to go to India to understand the opportunities fully and to be able to see where the real advantages for your own company are and What's This India Business? will show you how to do that, from the moment you land in India for the first time, through the etiquette and more challenging htmlects of India for Westerners, to the moment when you can start to gain the added value working with Indian business brings. More details available from move@on-off.co.uk and watch out for the book that will show you how to be part of a real business revolution.